Theory No.9 – during a flight from a Viking raid, a group of monks stopped there and sang the 51st Psalm, the Latin version of which includes the words Miserere mei, Deus, which can be delivered in English as “Pity me, O God”. Dare I say, there may be more! Anne Isabella Milbanke, as has already been related on this blog, was the all-too-brief wife of the very famous and very unpredictable Lord Byron. This short-lived affair brought a singular and very talented child into this world, namely one Ada Lovelace, perhaps the world’s first computer programmer. But of this strange and swift affair, the North-East of England can not only claim the venue of the famous wedding (Seaham Hall, in 1815), but it can also bag Milbanke herself as a daughter of the region. For Anne was born at Elemore Hall, two or three miles south of Hetton-le-Hole in Co.Durham. The stately pile we see there now (as then) was built in the mid-eighteenth century by George Baker (the then owner) to replace an earlier manor house. It stayed in the family for its entire existence as a private residence, until the mid-twentieth century. Sir Ralph Milbanke and his wife, Judith, who were otherwise based at Seaham Hall, found themselves staying at Elemore in May 1792, where young Anne was born on 17th May – the couple’s only child. She was educated to a high standard and became a formidable (and perhaps prudish) intellectual and moral figure – quite the wrong sort for the likes of her half-mad future husband. 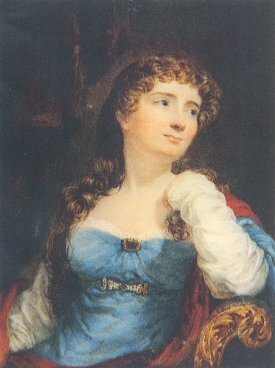 Byron (if you’ve read my related post) described Anne as “a very superior woman, and very little spoiled, which is strange in an heiress … an only child, and a savante … a poetess, a mathematician, a metaphysician … there was never … a more amiable being.” After a long, drawn-out courtship, he finally did the decent thing in 1815 – then almost immediately abandoned his pregnant wife for good. She saw out a still comfortable existence thanks to her well-to-do connections and an inheritance which saw her, eventually, become Baroness Wentworth by a circuitous route. Along the way, she devoted herself to social causes, including, notably, the abolition of slavery. She died in 1860 (outliving her talented daughter) and was buried in London. During the course of the twentieth century, Elemore Hall passed out of the hands of the Baker family, through the hands of the local council and National Coal Board, and has for many years been known as Elemore Hall School – an institution for children with social, emotional and behavioural problems. It still sits in wonderful isolation in its woodland setting, and has enjoyed a recent bout of remedial work to its decaying fabric. In 1830, a little to the north-east of Durham City, took place one of the county’s most infamous murders. Two servants, left alone at Hallgarth Corn Mill, found themselves, apparently, the victims of an attack by a gang of local rogues. But all was not as it at first seemed. No pity for her soul. And welter’d in her gore. Had done the dreadful deed. Now, woe betide thee, Thomas Clarke! Would fight till he did die. No bruises could they see. And therein lies the clue to the true murderer’s identity: No bruises could they see. Another 28 stanzas later and poor young Clarke was dead by way of the hangman’s noose, his corpse on its way to Durham Infirmary for dissection. The evidence suggested that he himself had committed the dastardly deed rather than the ‘phantom’ gang of Irishmen to whom he had so earnestly pointed the finger of blame. He pleaded his innocence until his dying breath, the case arousing astonishing levels of public interest along the way. Little wonder, then, that some unnamed local poet should cash in on the tragedy with his lengthy ballad. Precisely upon the spot where the shiny new University Hospital of North Durham now sits (the old Dryburn Hospital) is the site of Durham’s old gallows. The venue dedicated to the saving of lives these past several decades was, strangely, once the setting for the violent dispatch of life for many a year. It is perhaps doubly ironic that the site is also opposite County Hall, the centre of present-day local government. The older part of the now largely modern hospital complex was once Dryburn House (or Hall), and in its grounds was located the gruesome place of execution for local ne’er-do-wells. All sorts of folk were sent to their deaths there, including some accused of witchcraft – and others of being gypsies! Much of this happened during the tough old days of the sixteenth century, and one execution in particular stands out from the rest. It concerns a troublesome Catholic priest by the name of John Boste, who had for years made a damn nuisance of himself by preaching secret masses and making a second home for himself of various priest-holes across the land. Eventually he was collared near Durham City, and sentenced to hang at Dryburn on 24th July 1594 – not before, however, a spell on the rack in the Tower of London, where he refused to renounce his Popish beliefs. He was to be hanged, drawn and quartered, of course, but could not have imagined the horrendous nature of his eventual death. As is often the case with botched hangings, the ‘drop’ was pitifully insufficient, and the poor cleric hung for some time kicking and twisting on the end of the rope – until the executioner cut it and he fell to the ground. As he stood there, gasping for breathe, the hangman pounced on him. He was first castrated, then his abdomen was slashed open, allowing his insides to spill out – and was then polished him off by having his heart cut out. Oh, then his head was removed and displayed to the watching throng. Then there was the quartering to sort out, too, of course. 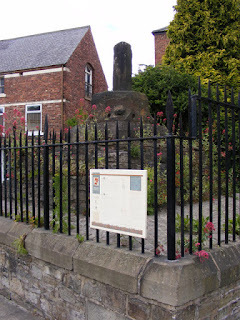 Boste was canonised in 1970, and pilgrims still visit the nearby Durham Martyrs’ memorial, which was erected to the memory of Boste and two of his similarly executed comrades. This most famous of military encounters – perhaps the most notable in County Durham’s history – took place between the English and (of course) the Scots on 17th October 1346. On this occasion, it was the former who emerged victorious, placing the latter on the back foot for many years thereafter. The battle took place during the Hundred Years’ War between England and France. The French, keen to divert the enemy away from hostilities in the south, persuaded King David II of Scotland to open a second front – which he duly did (if a little late) in the autumn of 1346. In early October, he led 12,000 troops over the border and into the northern counties of England, expecting little in the way of opposition. After a week or so of pillage, they arrived on the outskirts of Durham City on 16th October and camped at Bearpark, to the west. The English, however, had drawn together a military presence in the area, and, under the command of the likes of the Archbishop of York and the Lords Ralph Neville and Henry Percy, skirted around the threatened city considering their options. Early on 17th October 1346, a Scottish raiding party fell upon a branch of the English army, were duly routed, and were then followed during a hasty retreat to the site of the main invasion force. Various manoeuvrings followed in the ensuing hours, until the two forces were drawn up against one another at roughly the spot where the present-day railway line crosses the Great North Road (now the A167). A procession of monks from Durham Cathedral then performed a ceremony within sight of the brooding Scots to raise the spirits of the English ranks. The English, though fewer in number, were better positioned than the Scots; and their longbow salvos soon overwhelmed the enemy’s pike. After three hours, King David of Scotland slipped away wounded, but was found hiding under a narrow bridge which still crosses the River Browney to the east of Bearpark. The day, for the Scots, was lost, and their king taken south – where he languished in Odiham Castle, Hampshire, for more than a decade. He wasn’t released (on payment of a hefty ransom) until 1357. 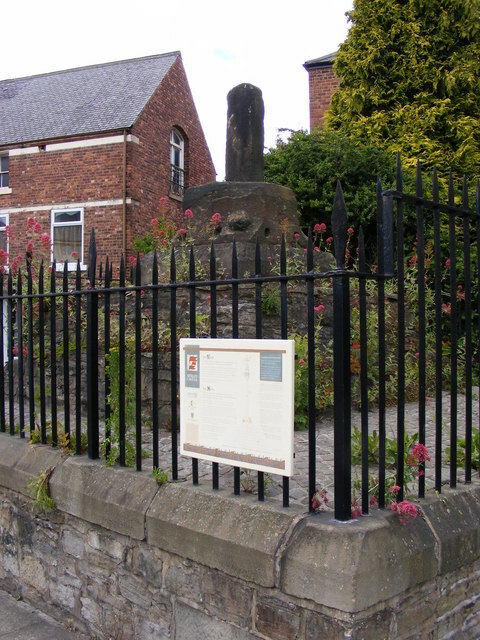 As for the commemorative cross, this was erected by Lord Neville shortly after the battle. It has been periodically vandalised and altered over the years – but a small fragment remains in the nearby suburbs.